I was so happy this morning with my jeepney ride. 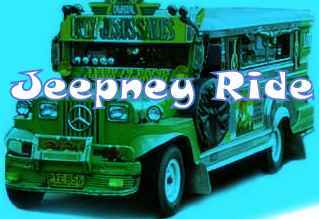 The music played in the jeepney are Parokya ni Edgar songs. I like this band since I was in high school. I like their cool songs and their comical lyrics. My brother was the one who influenced me to like Parokya ni Edgar. He was a fan that almost all of the songs I heared from his playlists are songs of Parokya ni Edgar. Hearing these songs once more while having a jeepney ride was so relaxing and made my ride enjoyable. Here is one of the Parokya ni Edgar songs form Youtube. A sad news came up this afternoon. A passenger van hit a passenger jeepney resulting to the death of a lot of passengers. It happened at our neighboring town at our province. The accident was fatal for what was left to the van was the flooring part only. It was cut horizontally in the middle by the accident. Mostly of the passengers were nursing students. I am sadden by the news and it is alarming for I always travel going home riding passenger vans. Hope this would remind drivers to be very careful and watch out their speed in driving. It is always my prayer for passengers out there that may God bless our trip.